Sort out dive log computer compatibility problems and getting your old dive computer data into your new software. Tell me if this sounds familiar. You’ve been using a particular dive computer for quite a while, and have hundreds, if not thousands of dives logged using the software it came with. Now, you’ve decided to move from a PC to Mac, and need to find some way to move all your logged dives from PC to Mac, but the dive computer manufacturer doesn’t have a Mac version of its software, and they make matters worse by locking you into some proprietary logbook format. Well, that’s exactly what I’ve been dealing with for the last couple years. In fact, I’ve kept a netbook around, running Windows XP for about 5 years now, simply because it was all I had to get dives out of my (recentyly dead) Subgear XP10 dive computer. All of my computers run either Linux or Mac OS X, yet I’ve been forced to keep this one little machine running Windows for exactly two programs; Subgear’s Dive.Log and GAP for generating decompression tables. I don’t yet have a solution for GAP, but I’m working on getting it to run under Wine on the Mac. However, after much frustration, I have finally managed to get all of my dive computer data out of SubGear’s Dive.Log and into a dive logging program that is compatible with Mac OS X. In my case, I made a move away from my old SubGear dive computer for good, replacing it with a Shearwater Petrel. That means I don’t have a need to import dive data directly from the XP10 into the Mac. I simply wanted the dives out of the Subgear, and into whatever software I’d use moving forward. The Shearwater Petrel syncs through Bluetooth and the company supplies dive logging software that is already Mac compatible. You’d think simply exporting dives from one and importing into the other would be a piece of cake, but not so as neither would support a format that is common to the other. If you’re lucky, your dive computer software will support exporting into a more or less universal format. Examples are DAN DL7 or DL1, UDCF or Excel file like CSV. The issue I had is that Shearwater Desktop (Shearwater’s name for its dive logging program) wouldn’t import any of those. Just getting Dive.Log to export was no picnic. So, I turned to diveboard.com, where I’d created an account some months back. DiveBoard has the ability to import DAN and UDCF files, along with a few others. It’s pretty cool (here’s my profile: http://www.diveboard.com/joescuba), but I haven’t taken the time to really engage with it. The problem I had was DiveBoard wouldn’t import my Dive.Log files correctly. Either they’d bomb out as corrupted, or not work for some other reason. That magic bullet came in the form of a clue inadvertently provided by Linux creator, Linus Torvalds. Linus, it turns out, is an avid scuba diver. As such, he’s taken a natural interest in dive computers and related software, especially related to Open Source and compatibility with the Linux operating system. I ignored that link for my first several attempts at importing data. Frustrated, I decided to stop trying and just poke around in Subsurface a bit. It imported my dives from the Shearwater Petrel without a hiccup, and is really a more robust program than Shearwater Desktop, so I was already planning to use it as my primary logging program–especially since it will run on Linux, which is my preferred OS anyway. Having dug through about everything that Subsurface has to offer, I decided to see what divelogs.de is all about. Turns out, it’s a bit like DiveBoard, although not as pretty. I figured if divelogs.de is good enough for Linus to put in Subsurface’s menu, it’s good enough for me to create an account (visit my profile page here: https://en.divelogs.de/log/joescuba). Naturally, now that I was a proud divelogs.de member, the next step was to see exactly how one goes about uploading his or her dives to the site. And, there it was… shining like a beacon on a dark, foggy night. Under a link labeled “Import logbook,” they list a fairly exhaustive collection of supported formats, and glistening near the bottom of that list is “Subgear Dive.Log.” In my joy, I believe I wept a little. My native Dive.Log file imported flawlessly, with individual dive profiles completely intact and all the supporting data right where it belonged. BUT, I still needed to get the dives into Subsurface and/or Shearwater Desktop. As it stands, I’m half way there. From divelogs.de, I was able to export a UDCF file that Subsurface imported easily. It took a couple days of screwing around but the bottom line is I now have fully platform independent dive logging program that supports my complex technical dive profiles stored in the Shearwater Petrel AND has the dives stored that had been previously locked away in an obsolete netbook, running an obsolete operating system. There are MANY uber-cool things to love about divelogs.de, as well as Subsurface, so I’ll profile both independently when I get a chance. In the mean time, I’ll bask in newfound glee as I upload dive profiles with reckless abandon. This entry was posted in Diving Safety, New Dive Gear, SCUBA Gear Reviews, Technical Diving and tagged dive computer, diving equipment, diving safety, lake tahoe diving, nitrox, padi altitude specialty, tec gear, tech gear, technical diving, xp10. I have one question about divelogs.de. If anyone can answer it, please do. Somewhere in the FAQ, it states that, by changing the number of the first dive, all subsequent dives will be renumbered consecutively from there. I can’t seem to find a place where that number is editable. I’ve also tried importing a renumbered file from Subsurface, but divelogs.de reverts back to starting from number 1. It’s kind of a vanity thing, but I have made almost 3,700 dives over the years and would like the numbering to be correct. My first 30-something years of dives are all paper logs, so obviously there’s no way to import them, but I’d like to have the numbering right. And, yes, the DLD format provides much more detail at import than UDCF. AWESOME!! We should all be grateful to Linus and Rainer for what they’ve done with Subsurface and divelogs.de. They’ve resolved so many issues that the computer manufacturers don’t seem interested in, I will be a champion for both in every class I teach. I did some digging around and answered my own question. 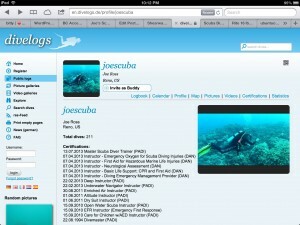 The FAQ indicates you go to your profile page to set the starting dive number. I went to that page several times and just couldn’t find it. To set the starting dive number, you actually need to click on the “my registration” link down the left column. There’s an obvious field for starting dive number on that page. http://www.divinglogs.de is a great software site, but come on Joe, you surely cannot count diving with trainees in a pool as dives!!!? Surely a “dive” is counted as dropping below 5metres in open fresh or sea water. A swimming pool is just a swimming pool with tiles and unsavoury human bits at the bottom!!! Best Wishes! That’s great to know. Fantastic job with divelogs.de. I’ll do everything I can to spread the word!